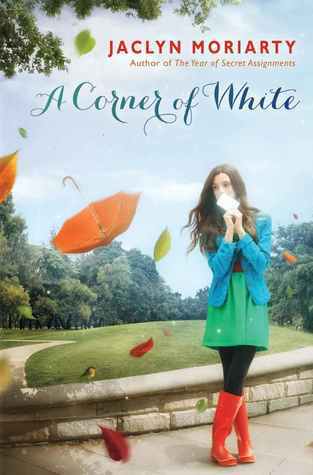 A Corner of White by Jaclyn Moriarty. Arthur A. Levine Books, 2013. Face Value: I’m mixed on this cover. On the one hand, I find it a little twee, with the girl and the umbrella and the wisps of floating colors on some kind of magical path. On the other hand, the girl is wearing clothes that Madeleine actually wears in the book. Also I am pretty sure I would wear that outfit. Does it Break the Slate? Absolutely. While feminism not the major focus of the story, the multifaceted female characters lead to a Slatebreaking result. Plus, there’s nothing better than when girl characters turn out to be both smarter and more powerful than others would lead us to believe. Who would we give it to? This is a good bridge fantasy because it actually includes a healthy bit of contemporary realism. It’s also incredibly clever, with sharp dialogue and a really different kind of fantasy world. If you’ve read and loved Moriarty’s previous books, you might be surprised by the difference, but you definitely won’t be disappointed. Review: It’s hard to explain the particular brilliance of a Jaclyn Moriarty book if you haven’t read one. She gives whole new life to the epistolary novel, telling us far more in assembled letters than an omniscient or first person narrator could. This book is actually a departure from her other work, because while letters still play a major role there are major sections that are third person narrated, and only two major storylines to follow. It’s also a departure because it brings in a fantasy element. Like in her other books, characters who don’t really know one another write to each other. But in this case, Madeleine lives in our world as we know it. She and her mother have “run away” to Cambridge, where Madeleine is being homeschooled and something might be seriously wrong with her mother. Elliot lives in the kingdom of Cello, a world where Colors are personified and the major danger faced by the people there. Elliot’s father has been missing for years, disappearing after a violent Purple attack that killed his uncle. They discover each other through a crack in their worlds – letters in a sculpture and a parking meter that neither one is entirely about. Still, their correspondence sparks changes in both worlds, that ultimately cannot be undone. There are a couple of really brilliant and unique things about this book. The first is the kingdom of Cello. Can you think of any other fantasy world that also has technology? I’m not talking about dystopia, I’m talking about an alternate fantasy universe that has also moved forward technologically and socially. Here is a kingdom that has magic, but also has fax machines. Fascinating, as well as really well crafted. Secondly, Madeleine’s relationship with her parents is seriously fraught, pretty sad, and absolutely compelling. It’s hard to know what the truth is, but as the layers get unburied, it’s hard not to empathize with her and admire her ultimate strength in the situation. Thirdly, all the loose ends come together. It might seem like some of the notices from the paper are only there to add color and contribute to the world building, but there are more to the frivolous missives of Princesses Ko and Jupiter than meets the eye. I can’t wait for the rest of this trilogy to see where it’s all going. This entry was posted in Reviews, Young Adult and tagged Colors, England, Epistolary, Family, Fantasy, Magic, Technology. Bookmark the permalink.